Are Claims of Currency Manipulation Just China Bashing? The argument that China is manipulating its currency needs more analysis, not rhetoric. Although China’s leadership recently announced that the RMB exchange rate would over time be liberalized, the exchange rate remains a controversial topic. The RMB has been under scrutiny in recent days, since the U.S. Treasury yet again found China to be intervening excessively in exchange markets to keep its currency artificially undervalued. This is a complex issue that has its supporters and its opponents. We try and explain it here. Supporters of those who label China a “currency manipulator” show that China has been adding an increasing quantity of dollars to its reserves since 2003 in order to maintain a lower-than-warranted exchange rate. The RMB is fixed to a basket of currencies, including the dollar, and maintained within a given band, but it is asserted that this band value is much too low, given China’s productivity growth. The main goal of this policy, it is maintained, is to increase Chinese exports abroad, thereby weakening exports from competitor nations and generating a trade surplus for China. This leads to distorted trade policies, and can damage other nations, particularly when they are in an economic downturn. If China played by the rules, it is believed, this would result in larger economic benefits for other countries. Some analysts predict that a reduction in China’s trade surplus would result in an increase in exports from the United States and the creation of hundreds of thousands of well-paying jobs. The assumption is that Americans would pick up manufacturing jobs that have been moved overseas and will once again produce goods for export to other nations. Opponents of the idea that China manipulates its currency assert that this allegation is a type of “China bashing,” carried out for political purposes and containing little economic merit. These analysts contend that the currency manipulation argument becomes a larger issue only when it is politically convenient, as interest groups in favor of legislation against China gain ground. They also argue that China’s chosen type of “crawling peg” exchange rate is valid since experience has shown that other types of exchange rates, particularly a fully liberalized exchange rate, can be harmful if the currency suddenly changes value. Some scholars have also found the currency manipulation allegations to be counterproductive, as they result in a further depreciation of the currency. On economic grounds, opponents of the currency manipulation camp show that the United States in particular has benefited from China’s low currency values through the purchase of cheaper goods. Consumers buy goods from multinationals that have relocated to China, and as a result, both American consumers and large firms gain from this process. China itself rebuffed the recent Treasury finding that the currency is undervalued, calling on the United States to move past this contention and maintain productive trade ties with China. The debate is not only inflammatory, with accusations on either side, but also frustrating, since the two sides are talking past one another. Some of the assertions on either side are flat-out incorrect: the idea that if China was not depreciating its currency, manufacturing jobs would move back to the U.S. makes little sense given that the cost of labor (wages) is the primary concern in the manufacturing sector. 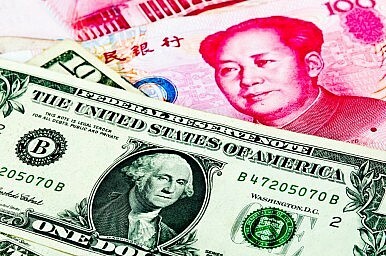 The argument that China’s type of exchange rate regime is valid because the economy is unprepared for a floating rate regime ignores that fact that maintaining the crawling peg exchange rate as China does requires significant intervention, and that an appreciated crawling peg exchange rate would diminish accusations of currency manipulation. To get past the name-calling, a more extensive economic analysis needs to be carried out, to examine all of these considerations in turn. The questions it should answer are, how much surplus (or savings) do consumers reap from cheap exports from China? How much additional profits do multinationals gain from the cheaper labor? Where would the multinationals go if China allowed its currency to appreciate (i.e., would they return to the U.S. or go elsewhere in the world)? How effective has the U.S. (and have other countries) been in compensating for a loss of manufacturing jobs with gains in service sector jobs? Would the U.S. and other countries increase exports, and by what extent, if China allowed its currency to appreciate? What are the benefits to China’s purchase of U.S. debt which results from the current exchange rate intervention? The questions are numerous and I do not list all of them here; the point is that a real conversation about China’s currency would require a general, not a partial, equilibrium analysis, in which all economic factors are included. Only after this is accomplished can the supporters and opponents of the currency manipulation argument talk to one another. This issue has been a persistent, nagging one with no real resolution to it. Perhaps after a better analysis is performed, or eventually, after the exchange rate is liberalized (although some intervention in the currency market may persist), this loud dispute will find some resolution.